2010 Cristom, Mt. Jefferson Cuvee Pinot Noir, Willamette Valley. I ordered this wine at Chez Bruce, a Michelin star restaurant tucked away in London’s borough of Wandsworth where my husband and I celebrated a special occasion. 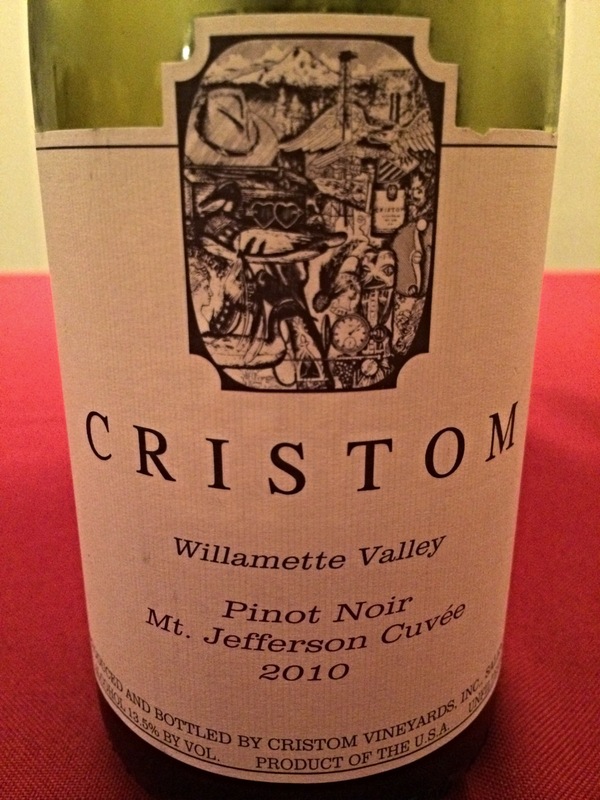 A very good quality Pinot Noir from Willamette Valley in Oregon, USA – a rising-star region gaining more and more popularity for its Pinots. TASTING NOTE: Pale ruby with med+ flavor intensity, pronounced red fruit on the nose, especially red currant and cranberries along with floral notes (violets). Very elegant on the palate and has opened up in the bottle over a few days after opening. Smooth silky tannins, medium bodied with pleasant acidity levels making it a food friendly wine. It paired very nicely with venison tartar and côte de boeuf (cooked medium) in the restaurant as well as with homemade pan-fried chicken liver three days later. (To take an unfinished bottle of wine home from a restaurant is a very SweervyWiney thing to do! Always ask the sommelier to keep the cork 😉 ) The wine is ready to enjoy now but will last for another 1-2 years. However this is a wine that can easily be enjoyed on its own – it will pair wonderfully with a round of good friends and maybe a few light snacks or neutral cheeses (e.g. Emmental or light-medium strength cheddar). If you are interested in purchasing this wine drop me a line and I will be happy to help you source it.